Use Thetrainline best fare finder here and get the cheapest train tickets across the UK. Why not save money on train tickets by booking online here and scoop back on average, 43% or more on the cost of train tickets to anywhere in the UK. Save even more with the super saver train tickets. The Best Fare Finder is designed to make sure you are offered the very best price on tickets to and from your destination. It is very simple to use, and covers all the major stations and towns in the UK. Users are required to select their starting point from a drop down menu, and then select the destination for their journey. The system is designed so that it only offers you destinations that can be reached from the station you have started from; for instance, selecting London Euston will give you different destinations to London Kings Cross. You can get your tickets here now with TheTrainline Best Fare Finder . Once you have selected the starting and finishing points you enter the sate you want to travel and, if you want a return journey, that on which you wish to return. The Fare Finder then offers you a chart of possible tickets and times, with the best prices highlighted for you to see. It really is that easy, and booking and payment are also as simple as it gets. If you are booking a journey by rail in the UK you should have a look at TheTrainline Best Fare Finder, one of the many excellent features to be found at Thetrainline.com. It is an excellent facility that offers convenience and money saving in one go. At the Trainline you also have access to many different applications and features that can help you get from one place to another with ease, and some that can even help you plan a holiday, with accommodation included in the package. The Trainline is well laid out, easy to use and comprehensive, and covers all of the major network operators in the UK. It is as useful for business users as it is for those travelling for leisure, and the online booking and payment system is safe, secure and simple to use. The Best Fare Finder is not the sole function you can use at The Trainline, for this is a comprehensive rail travel website aimed at making your life easier. Also available is Ticket Alert, which will email you when advance tickets you have enquired about go on sale, and The Trainline App which allows you to use the website from your smartphone. A Carbon Calculator allows you to see the difference in CO2 between a car and train journey to the same destinations, and there is even a section offering excellent tips on cheaper travel. Business users can open an account and get credit terms, the Eurostar is covered comprehensively, and you can find excellent deals on hotels, car hire and theatre tickets, making your holidays convenient by rail. The Trainline really is an all in one website for rail travellers and is a fantastic resource. 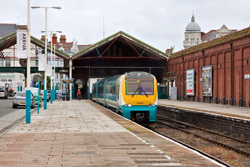 The extent of the UK rail network means that passengers can travel to a wide variety of destinations in England, Scotland, Wales and across the water to Northern Ireland. Furthermore, The Trainline also offers booking and travel information on the Eurostar service through the Channel Tunnel. The online journey planner allows you to select a variety of options and to look at different destinations, and is as comprehensive as it gets. Using the available rail networks it is possible to travel from London to Edinburgh without a change, and the fantastic Caledonian Sleeper is a convenient overnight train that is very popular with business users. Booking via The Trainline can yield excellent discounts, and there are many more benefits besides. Yes. Save on average 43% or more using TheTrainline Best Fare Finder. Truly a great way to save money on train tickets across the UK and beyond. We work in association with thetrainline and will love to hear from you on how you have found their services. Please take a minute and post your review on your ticket purchasing, changing or returns experience. Thank you for taking part in this review.